Ultrasonic algae control is the environmentally safe way to control algae using low power ultrasonic waves. The transducer, submerged just beneath the surface, is programmed to generate ultrasonic waves that inhibit the growth and spread of algae. The Algae Control device emits ultrasonic waves that fan out at approximately 180° or 360° from the front of the transducer depending on the model. The nutrient level, turbidity and shape of the body of water may affect the coverage area. Units provide coverage for up to 124 acres and multiple units are used for complete coverage. Your Maryland Biochemical Sales Representative will guide you in the appropriate sized unit for your application. All ultrasonic devices are “line of sight” technology. Ultrasonic sound waves will not go around corners or navigate around weirs or other solids. Ultrasonic sound waves will bounce off of hard surroundings, such as concrete. Ultrasound has been proven successful in many wastewater applications including lagoons, secondary clarifiers, EQ basins, effluent tanks just to name a few. 1. How does ultrasound work? Blue/green algae: Ultrasound hits the harmonic frequency of the gas vesicles (vacuoles) inside the blue/green algal cell and pops them. 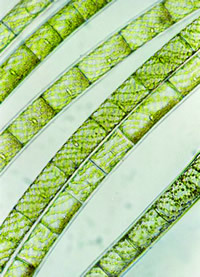 This causes the algal cell to sink to the bottom of the body of water. There, out of the direct sunlight, it cannot photosynthesize and it begins to starve and become weak. The bacteria at the bottom of the body of water then consume the blue/green algal cells. Other algae: Ultrasound hits the harmonic frequencies of the chemical bond that adhere the cytoplasm to the cell walls. When this happens the cytoplasm inside the cell visibly contracts away from the cell walls. In this state the cell can neither consume any food nor get rid of any waste. The cell starves to death over time. 2. Does it have any effect upon fish or other aquatic wildlife? Ultrasound is safe for use with other aquatic life including fish, frogs, snakes, turtles, and even otters. In fact, ultrasonic devises are being used in installations at fish farms and in koi ponds to save fish from the toxic effects of algae. 3. Will it kill duckweed, water meal, milfoil or cattails? Ultrasound only kills and controls algae and has no effect on either beneficial or invasive species of aquatic plants. 4. How long does the unit take to work? Typically, you will start to see a significant change in the pond’s algae color (from green to brown) in 3 to 4 weeks, or less. In a water body with thick algae, and/or very high nutrient levels, a complete kill may take as long as 4 to 5 weeks. During this time, as the algae dies, it will turn brown and may remain floating on the surface or just sink to the bottom depending on the species. We recommend removing any dead brown algae floating on the water. When the water appears clear after the initial algae kill, you may get a secondary algae bloom. This happens because sunlight can now reach the bottom, residual algae allowing spores to germinate. Do not be concerned. Leave your ultrasonic device in the water and it will kill and control the secondary bloom as well. This kill/bloom sequence may repeat two or three times as the “reservoir” of spores is exhausted. After that, the water should stay clear. 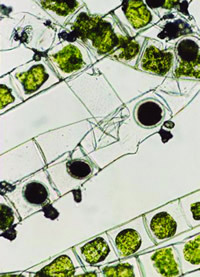 Major rain events can sometimes reintroduce spores that will result in an algae bloom. Leave the ultrasonic device in place and it will kill subsequent blooms. 5. How expensive is it to operate? Ultrasound is very inexpensive to operate because it only uses approximately 10 watts of power. That’s like running a small light bulb in your home. 6. What if there is no electricity at the pond? We sell three 24-volt models that can be operated with the optional Solar Power System. 7. How can I tell if my transducer is working? Look at the two green lights on the power supply box. The solid green light indicates that the power supply is receiving electricity. The blinking light indicates that the driver is sending power to the transducer to generate the ultrasonic waves.